With the name “Cash Runner,” you may be expecting a video slot that has a track and field theme, but in this case, the game’s developers chose a traditional route by including fruit icons, bar symbols and lucky sevens. The video slot’s graphics are high quality, and its bonus features enhance gameplay. Cash Runner is a Novomatic casino gaming product, one that gives you multiple chances to win. In addition to this video slot, the gaming developer also created games like Beetle Mania Deluxe, Fruits on Fire and Cash Balloons. With its soothing green background, a few dollars posted toward the top of the screen and poker chips lining the sides, the Cash Runner video slot brings the spirit of Las Vegas to you. The start button is green, and you’ll spot it at the bottom of the screen on the right-hand side. The autoplay and paytable buttons are located to the left. Near the bottom of the screen, you’ll see two sets of plus and minus signs. One increases or decreases the number of lines in play while the other lets you modify the bet amount. The screen displays the total number of credits that you have as well as your last win amount just above these function keys. Cash Runner is easy to play, and it features a high pay-out potential. Players who prefer pop culture themes may lose interest in it, but gamers who appreciate a solid slot that offers them the opportunity to win real cash will relish playing Cash Runner. With five reels and 50 adjustable paylines, you’ll have plenty of ways to win. If playing a large number of lines is overwhelming, you can decrease the amount, but to ensure that you have a shot at the biggest possible wins, we recommend that you decrease the amount that you’re betting per line instead of the number of lines that are in play. We don’t want you to experience the frustration of landing a win on a line that isn’t in play. In Cash Runner, the betting range is good since it lets both low stakes players and high rollers arrange the game according to their preferences. The video slot features Novomatic’s unique counting program. With it, you’ll have an easier time managing your budget if it’s one that’s fixed. If this is the first time that you’ll be playing Cash Runner, play a few rounds of the game’s free emulator to get a feel for it and learn its nuances. Once you’ve selected your bet amount and the paylines, you’ll be ready to spin. You can accomplish this manually or automatically. Spin manually if you intend to play the slot’s bonus game. In addition to Cash Runner, Novomatic has games like Big Catch, Roller Coaster and Amazing Stars available. If you’re the kind of person who likes to take risks to win as much as possible, then you’ll be especially interested in Cash Runner’s bonus game. Following a win, the video slot will give you the option to expand your winnings by trying your luck on the bonus round. For this round, the game chooses a playing card. To double your winnings, guess the right colour. To quadruple them, select the right suit. While playing Cash Runner, keep an eye out for the wild icon as well as for the scatter symbol. In this game, the scatter icon is a pay reward instead of a bonus feature. If it lands, it pays out on the reels instead of when it materializes on a win line. The wild symbol is a joker’s hat, and it will only land on reel three. When it does appear on the reel, it becomes a substitute for the game’s other symbols except the scatter. It substitutes other symbols to increase your chances of winning. 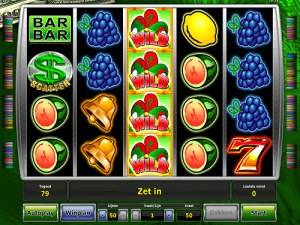 Symbols like watermelons, lemons and cherries populate the reels of Cash Runner. Pay outs begin with as few as three symbols showing up on a payline. For instance, if three lemons or cherries appear, then you’ll win 15 coins while five of either one of these symbols net you 150 coins. Grapes and watermelons pay out 100 coins when four of them show up. If five are present at the conclusion of a spin, then you’ll get 200 coins. The bar symbol pays out 50 coins when three of them materialize and 300 coins for five icons. If four bell icons are present on your reels when they stop spinning, then you’ll be rewarded with 200 coins, and if luck is with you and five appear, then you’ll receive 500 coins. In Cash Runner, the lucky sevens are one of the highest paying icons. When three of them land on the reels, you’ll earn 100 coins. The game pays out 2,000 coins for five lucky sevens. The scatter symbol is a dollar sign, and it pays out the most. If you receive four scatter symbols, you’ll win 1,000 coins, but if five should turn up, then you’ll be rewarded with 25,000 coins. Cash Runner is a video slot that provides plenty of at home entertainment. Bonus rounds and scatter symbols give you more chances to win while the game’s traditional elements are reminiscent of a classic Las Vegas slot machine. In addition to Cash Runner, Novomatic is also the creator of exciting slots like Lucky lady's Charm, 13 and Blazing Riches along with Chicago and Frog Princess, making gaming entertainment convenient.